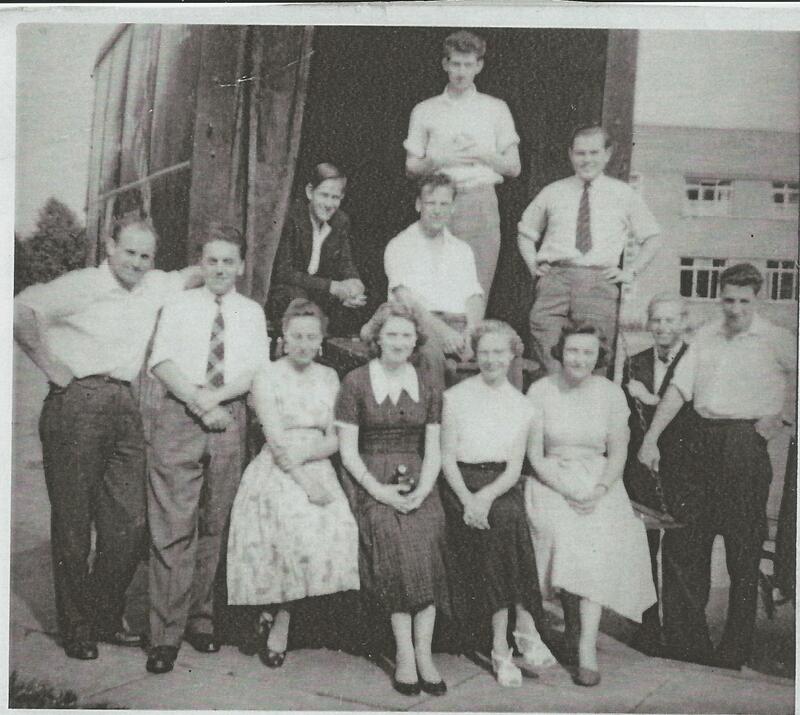 On the 14th December, 1948 a meeting was called at the home of Alan and Muriel Neal of people interested in forming a drama company to be known as the New Repertory. 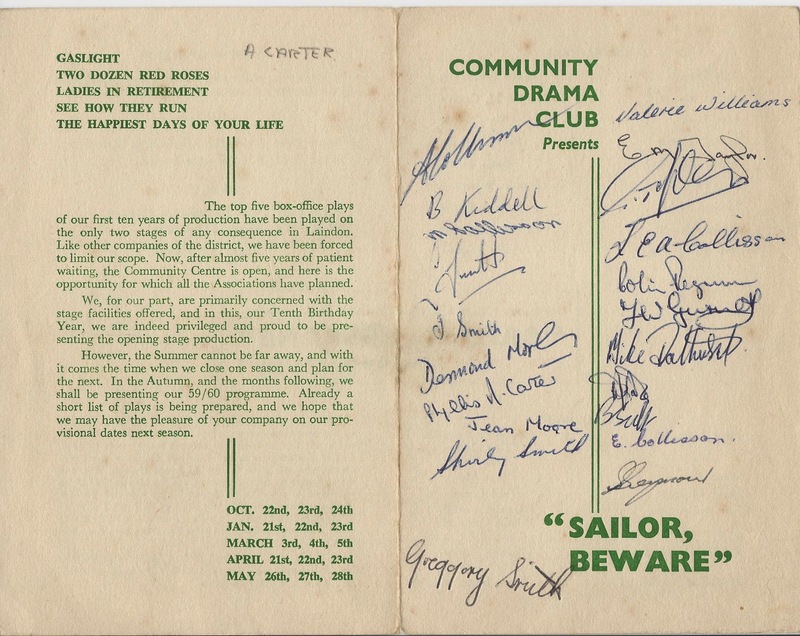 Some of the people concerned were already members of the existing local drama club, Langdon Players. As this club was rather large it was felt that the district was big enough to accommodate two companies. In no way was the new drama club setting up in opposition to the Langdon Players. The basic aim of the new company was to perform shows anywhere a hired coach could reach. The Essex Country Club in Basildon Road was initially accepted as the permanent home of the company and was hired for both shows and rehearsals. The rehearsals took place in a very large room which contained a billiard table and some chairs. A fire was lit in the winter but the room did not get very warm and it was very pleasant to huddle round the fire. The company started from scratch, especially regarding to equipment, so a fair amount of fund raising took place, plus the generosity of many members. The first set was made by Mr Bridgeman Snr. 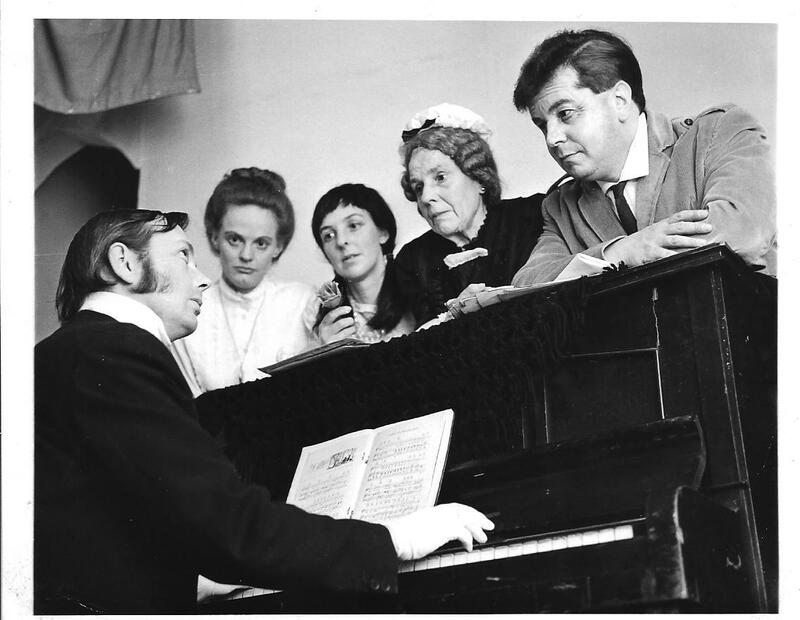 and the first time they rehearsed on stage was at the dress rehearsal of “Laburnum Grove”. At this dress rehearsal the fire prevention people arrived and the whole set had to be fire-proofed by the following evening. Mr Jackson a local character was appointed critic. The company did not want to be a company who were blind to faults but one which readily accepted criticism in the severest form. “Laburnum Grove”, “Fools Rush In”, “Love from a Stranger” and “Christmas Carol”; The latter being specially written for all the members of the company by Mr. Jackson. 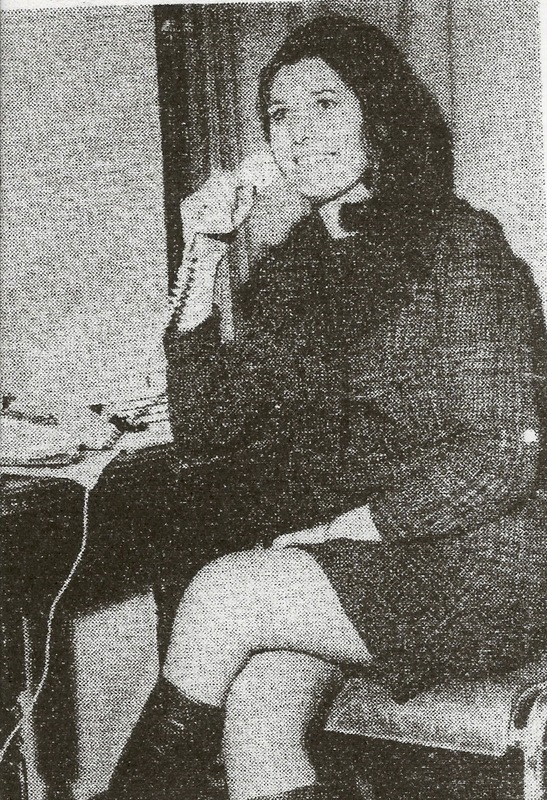 The Laindon Recorder offered the company a small space each week for a photograph and a brief life history of the members. 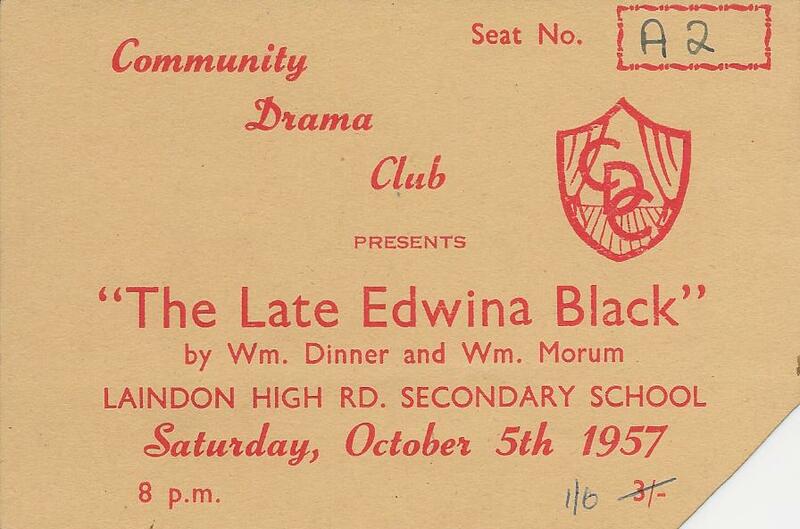 One of the most amusing events in 1949 was not so much a performance on stage but and incident off stage. Following a fund raising event in the August, Derrick Carter was stopped at 3 am on the way home by the local police wanting to know what he was carry in his tool bag. It was not an easy task to convince them that the tools had been used to erect a “men only” toilet at the bottom of someone’s garden, some how he managed to convince them. 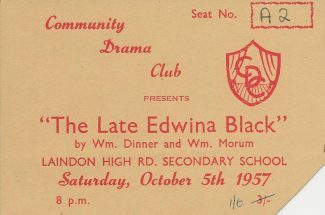 For the next year or so the company continued to perform at the Country Club and the City Bus Company ran a special bus from Laindon railway station and met the audience after the show to take them back to the station. A move was then made to make the Memorial Hall in Laindon High Road their permanent home as it was felt that a more central home would attract more members. The hall was very cold and bleak during the winter; fires had to be lit on arriving and a Tilley lamp was used to warm the dressing room! 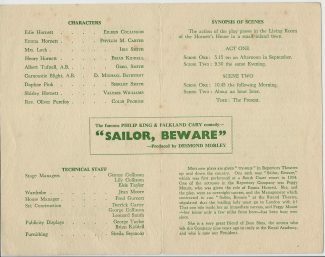 By the time the “New Rep” company was three and a half years old, no fewer than fifty-eight performances had been given. Unfortunately it was proving more profitable to take plays on tour than to perform locally. The following is some of the places they performed at: – Laindon Army Camp, Langdon Hills Hospital, Black Notley, Broomfield Hospital, Shoebury Barracks and many others. A proposal to build a new hall in Laindon was met with great enthusiasm, although the New Community Hall took many years to actually come to fruition. New Repertory performed a number of fund raising plays in aid of the new hall and a tableaux was entered in the local Laindon Carnival representing the Community Hall. 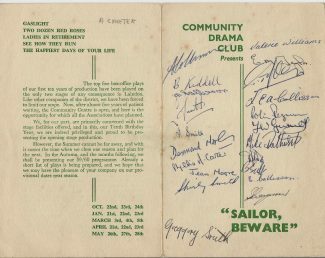 In 1955 it was decided to change the name to the Community Drama Club (C.D.C. ); however it wasn’t until 1959 that the hall became a reality. 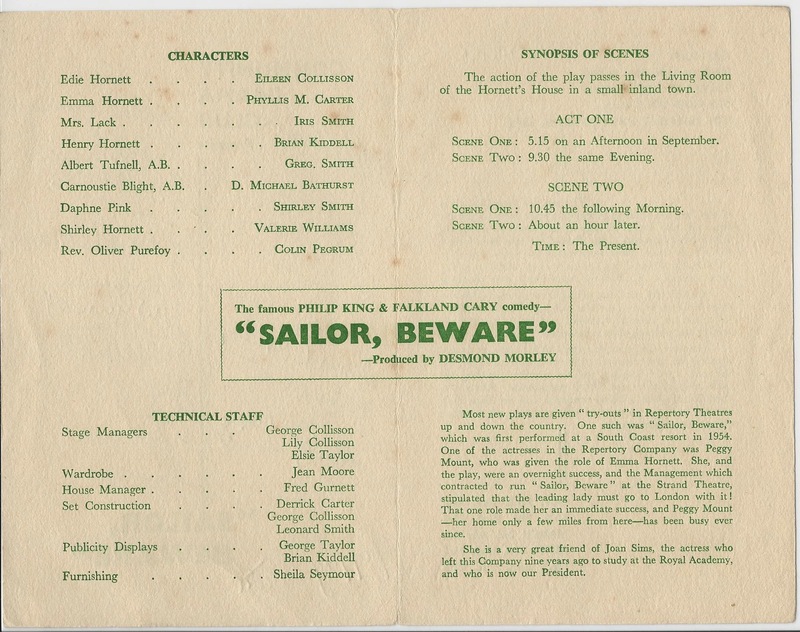 The C.D.C first performance at the new hall “Sailor Beware” took place in April 1959. A new set had been built for the occasion thanks to the generosity of the members who clubbed together and raised £50. It was however unfortunate that, on the opening night, there was no lighting and no curtains but as it had been said on many occasions: the show must go on! 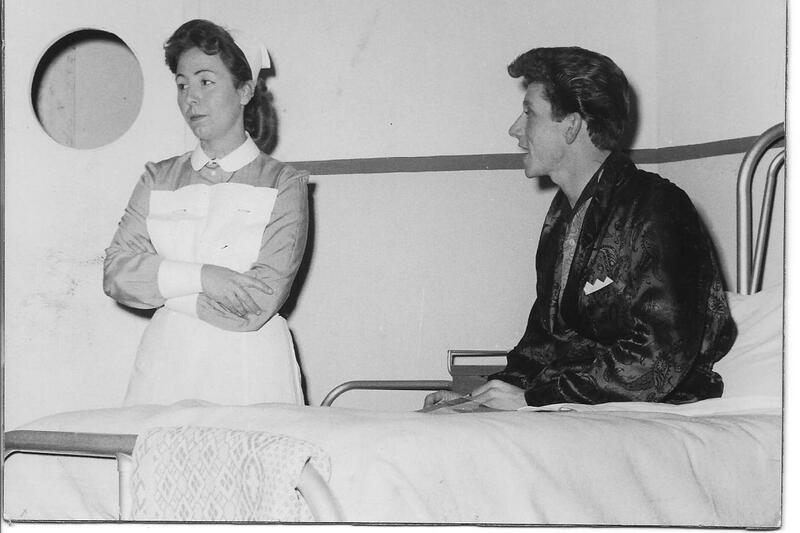 During the 1950s local lad Greg Smith join the cast and performed in a number of plays. Greg went on to be a successful Producer. Joan Sims was also a member. (Refer to the entertainment section for more information) Doris Gladwin won a scholarship to the R.A.D.A but as she was married with two little children, she declined the offer. Later “Slim” Simcock also enrolled with the R.A.D.A. Sometime in the early 1960s a junior section was formed under the guidance of Phyllis Carter aided by Lily Collisson. Five one-act plays were performed by the juniors. The chief aim was that every child should have the opportunity of being in a play and very often, extra parts would be written into a play. The drama club was still going strong when Phyllis left the area in 1974. It is no longer, does anybody know when the group final ceased. Adapted from a paper compiled by Phyllis Carter and Wendy Clark (nee Archbald) December 1969.